The 2016 Rao family vacation, or, we rode 55 coasters in eight days, baby! August 28, 2016, 11:16 AM · It began with a really big dream and ended with some really tired feet! The 2016 Rao Family Vacation (the Rao Family in this case refers to me, my ever loving and forgiving wife, and my three stalwart offspring) began with a dream to travel to eight different amusement parks in two weeks on a Clark Griswold-like road trip. 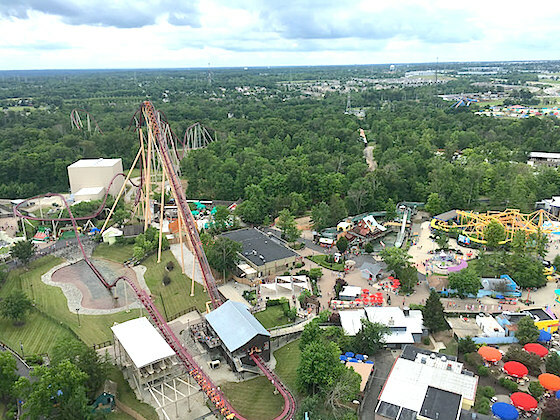 It was an epic dream which would have included stops at Kings Island, Cedar Point, Hershey Park, Dorney Park, Kings Dominion, Busch Gardens, Carowinds, and Dollywood, and would have encompassed well over 70 roller coasters along the way. However, as with any epic dream, the boring reality of budgets and human stamina eventually take precedence and our eight park dream trip became a five park Cedar Fair excursion (Kings Island, Cedar Point, Dorney Park, Kings Dominion, and Carowinds) utilizing Platinum Season Passes purchased at Worlds of Fun (my local Cedar Fair stationary carnival), with a short stint thrown in at our nation's capital to briefly visit the Air & Space Museum and the Lincoln Memorial just for grins. Despite downsizing the number of stops on the route, the vacation was still pretty epic in scope, especially when considering the continuous "load and unload" requirements for a trip of this nature, the 3,000+ miles we would be traveling, the 50+ roller coasters along the route, the 930' of combined Giga coaster first drops, and the fact that up to a dozen people would be involved in the adventure at various destinations along the way: my brother and his family joined us for the Kings Island/Cedar Point leg of the rip, as did fellow Theme Park Insider regulars Jim Koehl (seriously dude, Americana 1900 must become a reality! ), his son Anton, his compatriot in Theme Park Apprentice Scott E., everyone's favorite theme park map artist, Douglas "Blake" Hindley, and my aunt and uncle who visited with us in the great state of North Carolina. While not up to the coaster count caliber of AJ Hummel's Epic Road Trip from a few years back, the 2016 Rao Family Vacation was certainly a trip my wife and I will never forget (or completely recover from), and hopefully one that my kids will brag about to their own children someday once the psychological healing process is complete and only the "good" and "fun" memories remain! Rather than provide my traditional step by step regurgitation of the adventure, I think this time I will try to keep things a bit shorter and just cover the highlights and comparisons of the stops during our adventure, leaving out the day to day minutiae of the road trip and the constant cycling through of hotels, restaurants, gas stations, and speed traps. So, consider this trip report to be a summarized version of our adventures and if you have questions or need more details, feel free to post a comment and I will follow up. Let's begin by answering the burning question on everyone's mind: of the five parks we visited on this vacation, which one was the best? Well, the answer depends on the definition of the word "best". Clearly Cedar Point is the Godfather of all Amusement Parks, the best of the best. 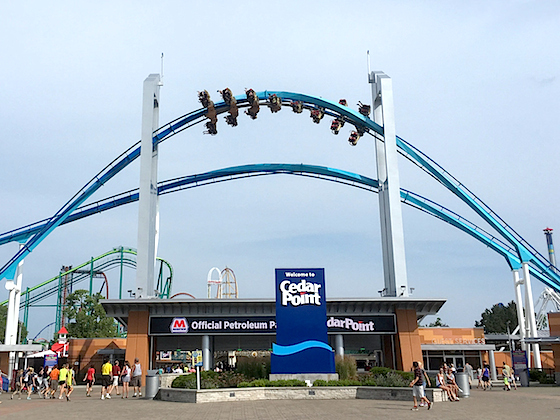 I honestly do not, at this point in my travels, think there should be any debate on the subject and consider the statement, "Cedar Point is the Best Amusement Park in the World," to be objectively true. However, the Rao family has a major love-hate relationship with the park. 1) We love theme (decoration + story) and Cedar Point is largely bereft of it, and 2) We love dark rides and Cedar Point is completely remiss in this department as well. But, 3) We love roller coasters, and 4) We love being transported to "somewhere else" when visiting a park, and on these two points, Cedar Point completely nails it. If you want to read a fantastic discussion about Cedar Point and what makes the place so special, then please check out Douglas Hindley's blog flume article on the subject (article link). His thoughts completely capture the essence of this one-of-a-kind amusement park, and are well worth your time, even if you never plan on leaving the confines of the CaliFlorida parks. So, Cedar Point is the King of the Amusement Park World. But what about the other parks we visited, where do they fit in the mix? The Rao family's consensus opinion on Kings Island is that it is Cedar Point-lite. The park has a great collection of BIG coasters, plenty of flat rides to keep visitors occupied for a day or two, decent food options, fantastic ride operations (two or three coaster trains running throughout the day), some fairly impressive decorative touches left over from when Paramount owned the park, and is clean, well maintained, and downright pretty to look at. The Rao family would slide this Mason, Ohio, amusement park in a notch below Cedar Point, but if it were our home park instead of Worlds of Fun, we wouldn't need to travel as much as we do! Dorney Park is much like the aforementioned Worlds of Fun, smaller in terms of ride scale and scope, but with some nice nostalgic touches that keep alive the rich history of the park. 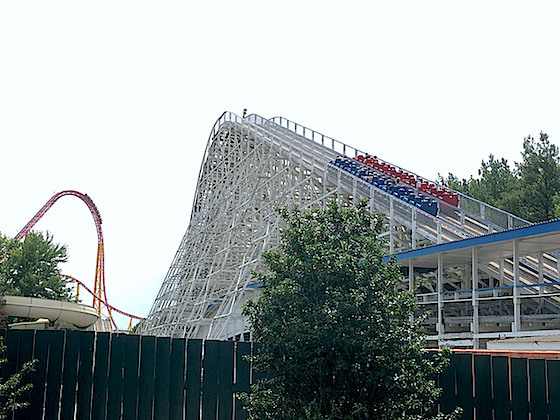 Attractions like Hydra, the newly refurbished Thunderhawk, and Talon spearhead a middle tier list of coasters, and some pretty good supporting non-coaster rides fill in the gaps. However, ride operations at Dorney were subpar during our visit, and the clientele, at least on this occasion, was mostly teenagers and little kids whose parents were unconcerned by their frequent bad behavior (for example children were running roughshod on the antique carrousel, jumping from horse to horse and skipping around the platform while the ride was in motion and the parents looked on seemingly oblivious to the safety of their kids and the courtesy that should be afforded to other riders – the ride operator was likewise unconcerned). While we enjoyed our time at Dorney, and some of the nostalgic touches it has to offer, it is not a destination park. We were able to accomplish EVERYTHING on our touring plan in three hours during a Friday night visit which should give you a rough idea about crowd levels (everything was walk on) and number of must-ride attractions (a half dozen or so). Dorney Park is probably the least of the parks that we visited, but it was a pleasant enough stop on a cloudy, slow Friday night. ...Carowinds. What a surprise this North/South Carolina amusement park turned out to be! Beautiful, sparkling clean, welcoming, filled with great attractions, and brimming with excited ride ops, killing it in every respect. Carowinds definitely gets the nod as the most pleasant surprise on the trip. Wow! From the fantastic main entry plaza, to the aesthetically pleasing placement of rides, shops, restaurants, and foliage (oh my goodness the crape myrtle trees were amazing! ), Carowinds is a beautiful park. The entire family was pleasantly shocked and very pleased we chose to end our trip at this terrific amusement park. While not up to the level of a Cedar Point in scope or scale, the Rao family puts Carowinds solidly in the second tier with Kings Island. It is simply a fantastic park, well worth a visit by any theme or amusement park fan. We thoroughly enjoyed our two days at Carowinds. Thoroughly. Heck, the Rao family is seriously considering the possibility of moving to North or South Carolina just so Carowinds can be our home park! So, to recap, Cedar Point is the King, followed by Kings Island and Carowinds (tie! ), then a few notches down the pole is Kings Dominion, and finally Dorney. All these parks are worth a visit, but only the first three are what the Rao family would consider "destination" parks. 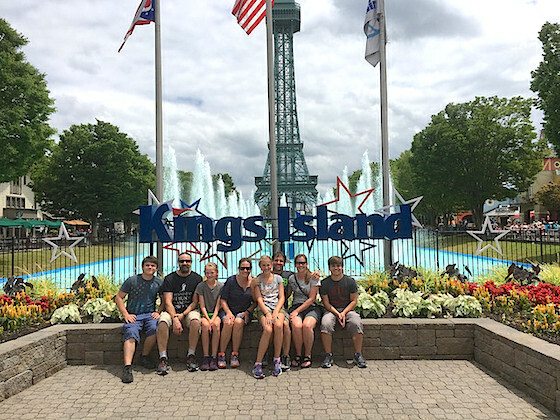 Let's be honest, the purpose of this trip wasn't to immerse ourselves in story, nostalgia, or listen to the ear-grating prattle of singing frogs (although there were some singing mushrooms at Kings Dominion), our goal was to ride coasters – the more thrilling the better! In these five parks there are nearly 60 roller coasters, but a few of them are really small kiddie coasters, which we skipped. So all told I think we hit about 55 coasters in eight days of touring, give or take. And there were some tremendous coasters, to be sure, but the crème de la crème, the big cheese, the grand poohbah remains Maverick at Cedar Point. It is not the tallest or fastest, but from the nimble lift hill to the mid-course launch, to the furious twists and turns that end the ride, Maverick is an exhilarating, one-of-a-kind experience. Even the addition of the excellent dive coaster Valravn could not unseat the undisputed king. Maverick is pretty much the best roller coaster the Rao Family has ever ridden. According to the Coaster Boys and Girls of the world, a giga coaster has a height or drop that ranges from 300 feet to 399 feet and completes a full circuit. I believe there were five giga coasters in the world at the time of this trip, with three of them, Millennium Force (Cedar Point), Intimidator 305 (Kings Dominion), and Fury 325 (Carowinds) in the United States. We rode all three multiple times on this vacation. So which one is best? Well, I am going to cop-out and say they are all great for different reasons. Millennium Force is nothing but pure, uninterrupted speed from beginning to end. It is a fantastic ride that never fails to disappoint (except at night when you get a mouthful of bugs because of the coaster's proximity to the bay). We rode Force about a half dozen times over the course of two and a half days, and loved every ride. It provides a wonderful, exhilarating experience. Intimidator 305 is the most intense giga coaster of the trio and the only one that sometimes causes people to "gray out" (start to lose consciousness) when riding (something the Rao Family considers a fun bonus). Even with the re-profiling of the coaster's initial sequence, it still packs a wallop. We rode this one during early entry and got in six or seven rides (sometimes without leaving our seat) before we moved on to other adventures in the park. Super intense, super cool, Intimidator 305 is a great ride. It is not the most "fun", but it is certainly the most intense. Finally, the newest giga coaster is Fury 325 at Carowinds, and it is a completely different beast. It has a very fast, intense first half which sort of combines the experiences of Force and I305 (without the "gray-out" g-forces of I305), but ends with three weightless, airtime hills to complete the course. We loved Fury 325. In fact, most of the Rao family preferred Fury 325 overall, but personally I find it impossible to choose a favorite. All three of these giga coasters are alone worth the price of admission at their respective parks. We are lucky to have them in the United States. Banshee at Kings Island > Afterburn at Carowinds > Volcano at Kings Dominion > Talon at Dorney > Raptor at Cedar Point. ‘Nuff said. 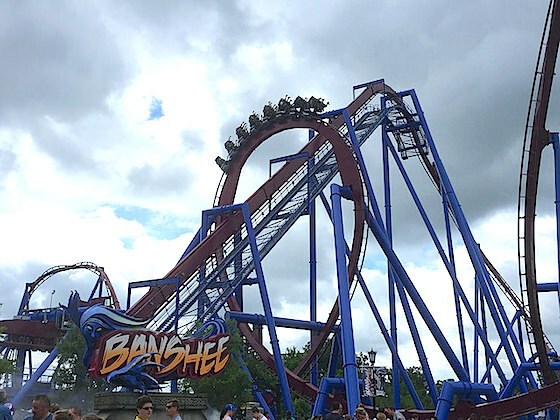 Banshee is just a tremendous ride filled with one brilliantly executed element after another, and that oh-so-slow final corkscrew is just fantastic. Banshee is still the Rao Family's favorite inverted coaster, followed closely by the highly touted Afterburn, which is equally fantastic, but we found it to be a bit more intense and a little less "fun" than Banshee. Third on the list is Volcano, however I should note that if its dual launches were followed by a bit more variety over the rest of the course, or if the surrounding faux volcano itself had any theming at all, this one-of-a-kind coaster would catapult to the top of our list. The Rao Family loved Volcano, but feel strongly that from a theming perspective it is a HUGE missed opportunity. Next on the list is Dorney's Talon which is a solid ride, closely related to, but much better than its sister ride, Patriot, at Worlds of Fun. And finally, Raptor is the only B&M invert we have ridden that is actually a little bit painful. It's a decent coaster, but the head banging towards the end of the course kills its re-ride-ability. There are several wooden coasters to choose from at these parks, but hands down we loved The Beast at Kings Island most of all. It is an excellent coaster that becomes transcendent once darkness settles in and the feeling that the ride is careening through the woods completely out of control takes over. No other wooden coaster, not even our beloved Voyage at Holiday World, can match the intensity and majesty of a night ride on the Beast. It is a fantastic adventure. The Rao Family feels we should give honorable mention to the Grizzly at Kings Dominion which has a very compelling night ride as well, however, unlike the Beast which still manages an expertly fun day time ride, Grizzly is just average (maybe even slightly below average) during the day. With 50+ coasters to experience on this trip there are quite a few I haven't mentioned yet that we enjoyed tremendously. At Kings Island we took multiple rides on Firehawk, Diamondback, Back Lot Stunt Coaster (much better than the Kings Dominion version), and Adventure Express (I like the ending lift hill – it's fun to chant with the Gods/Natives/Whatever as you pass by them on the way to the unloading platform). 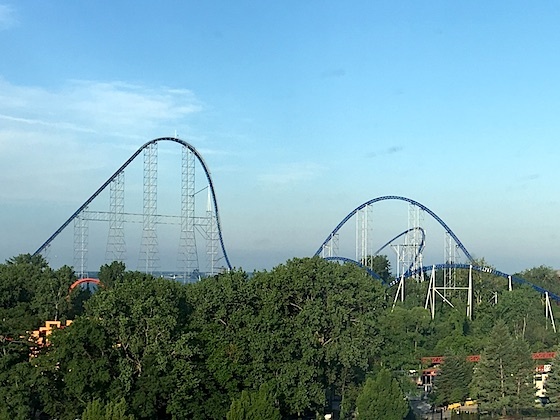 At Cedar Point, Gatekeeper (> Thunderbird > Wild Eagle), Valravn (> Gryffon > Shiekra), and, of course, Top Thrill Dragster (my six rides in one hour during the Platinum Passholder event on July 8th tied my TTD rides-per-hour record) are among the best coasters in the States, while Magnum and Gemini (when two trains are racing) are not-to-be-missed. Dorney Park has Hydra (love the Jo-Jo Roll) and Thunderhawk (not a great Woodie, but the refurb love it received certainly makes this 90+ year old ride a fun experience). Dominator at Kings Dominion is a nearly perfect B&M floorless, despite being the poster child of a "parking lot" coaster. And, finally, Carowinds sports several very good coasters including the hyper coaster, Intimidator (sadly, the second act of this ride really loses steam – like Diamondback at KI), Nighthawk (which in the Rao Family's opinion is better than Firehawk), and the Carolina Goldrusher (I am a sucker for those old Arrow Mine Train rides – with Thunderation at Silver Dollar City being my absolute favorite). We were very lucky to ride so many great coasters on this trip, with only a few providing less than pleasant experiences: King Dominion's Flight of Fear and Anaconda, Carowinds' Vortex and Hurler, all the "Wild Mouse" coasters (which we call "Yay" / "Ouch" rides) at the various parks, and of course, the poster child of pain, Mean Streak at Cedar Point. If you like great roller coasters, then this trip was for you, because we rode some of the best this planet has to offer! With 50+ roller coasters on the docket, there wasn't a lot of time for other rides, but we did catch a few, and a couple were quite notable. The first one I want to mention is Cedar Downs at Cedar Point. This racing derby ride is quite unique. Instead of horses going up and down on a spinning platform, they move forwards and backwards simulating the act of passing and being passed during a horse race. The Rao family agrees that Cedar Downs is the best non-coaster attraction at Cedar Point. Another winner was The Whip at Dorney Park. Opened in 1920, this attraction has been thrilling families for nearly 100 years. It was so much fun, and one of the highlights of our short visit to Dorney Park. As for dark rides, Kings Island, Kings Dominion, and Carowinds all have a version of the Sally shooter, Boo Blasters on Boo Hill. However, they are all pretty pathetic. Most often the guns don't work at all, or when they do, the targets fail. Thankfully the air conditioners work, so at least the rides offer a respite from the summer heat. We know Cedar Fair is slowly adding some dark rides to their various parks (Knott's and Canada's Wonderland have already received theirs), but the company has a long way to go to pass muster in the dark ride department. 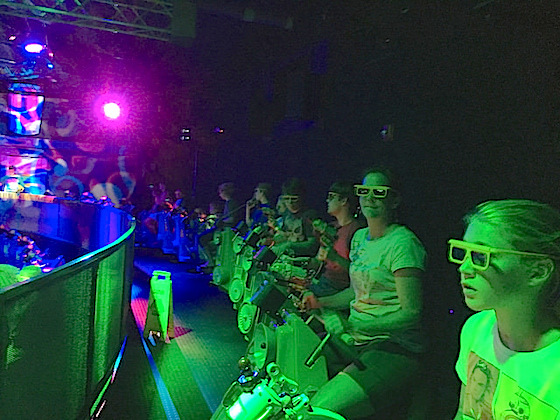 Speaking of dark rides, both Kings Dominion and Carowinds have 3D/4D "action" theaters. At Kings Dominion they are currently showing a 3D movie called Robinson Crusoe, which is a serviceable cartoon, but nothing that belongs in a theme park. At Carowinds, they refurbished their Action Theatre for the 2016 season and added the "world's first" intra-active 3D attraction (their words not mine), Plants vs. Zombies Garden Warfare 3Z Arena. They did a fine job with the theming of the attraction as both the inside and outside of the theater have a high level of decorative and narrative touches that draw visitors into the story; however, the attraction itself is a swing and a miss if you ask the Rao Family. The biggest issue is that you really cannot, amongst all the confusion of the theater and explosions of the film, see your specific shot. At least not in a semi crowded theater (there are 60+ seats, and 60+ blips of light blasting on screen - good luck finding yours!). The Intra-active buzzword apparently means that "riders" can interact with the opposing team's screen during the competition but because you'll have great difficulty finding the blip of light representing your shot, the "intra-active" aspects really have little or no impact on the experience. All in all, Plants V Zombies was a one-and-done for the Rao Family, and not something I want to see repeated at other Cedar Fair parks. Oh, in case you are wondering, we were on the side of the Plants, and we won (thanks largely to my kids who seem well equipped to handle any video game based attraction theme park designers might decide to throw at them). One other note on non-coaster rides is that the Rao Family always enjoys a good, old fashioned carousel (or carrousel, if you prefer). Granted, we don't hunt them down at rope drop, but they are something we generally ride at the end of the day on the way out of an amusement park. On this trip, each park showcased a vintage carousel (I believe Cedar Point's Midway Carousel built in 1912 was the oldest), but we enjoyed our ride on Kings Dominion's creatively named "Carousel" most because the ride operator seemed to be having a fantastic time doing her job (pretty much the only good cast member moment at Kings Dominion). Carowinds ‘Character Carousel' was our least favorite (we didn't even ride) because with its garish blue and orange color scheme the ride simply did not look like a vintage carousel. Outside of Knott's Berry Farm, Cedar Fair parks are not usually known for their dining options. Sure, they have your overly-expensive burger, chicken strip, French fry options, but nothing to really get the Disney-centric foodies in the Rao family excited. However, we did manage to find several stops during this trip that offered decent food options. At Kings Island we enjoyed a meal at Skyline Chili (the chili cheese fries were especially good), and a stop at Graeter's for some delicious black raspberry chocolate chip ice cream. At Cedar Point we ate at Famous Dave's on the marina (a tad bit more expensive than our local version, but still offers some above average BBQ), and Pink's inside the park (pro tip: Pink's burgers are very good, better than their "snappy skin" dogs, IMHO). For dessert we visited Toft's Ice Cream, and had some delectable elephant ears at that little shop to the left of the main park entrance. We didn't dine at Dorney or Kings Dominion opting for offsite dining instead (however Rita's makes a fine gelati, and Kings Dominion has a couple Dole Pineapple Float stands – although for whatever reason we did not think their version was as good as Disney's). At Carowinds, we did check out the Harmony Hall food court and entertainment venue, which was amazingly clean and brilliantly maintained, but we opted for pizza and crab fries at Chickie's & Pete's instead. Again, these joints provided decent, serviceable, amusement park food, but nothing to "blog flume" about. Outside of the parks, we made it a point to visit several lesser known (to us, anyway) restaurants. In Mason (near Kings Island) we partook of some wonderful pretzel appetizers and fried fish fancies at the (Old Bag of Nails Pub). In Lakeview (near Cedar Point) we had amazing grilled cheese sandwich concoctions at (Melt Bar and Grilled Pub). In Washington DC, we ate a lovely dinner at (Elephant and Castle). In Fuquay-Varina, North Carolina, we splurged on a fine Italian meal at Garibaldi (it doesn't look like they have an official website). And near Carowinds, in Fort Mills, we visited (Hobo's) because Cowfish restaurant was way too busy the night we stopped by. All these restaurants are very excellent dining options that come highly recommended by the Rao Family. But above all, we loved the lunch we ate at Kreggars Tap and Table in Ashland, VA, about twenty minutes away from Kings Dominion. Everything we ordered was terrific – fine dining food served in a casual, friendly environment. The PBJ Cheeseburger with a thin layer of jalapeno grape jelly and creamy peanut butter, was an unexpected taste eruption, where the PB&J lightly enhanced the flavor of an excellently prepared half pound of delicious cow. The otherworldly Texas Brisket Street Tacos featured some of the tastiest brisket this KC BBQ fan has ever tasted. The chicken tenders with fries, jicama slaw, and some kind of house made, fantastic honey mustard dipping sauce were among the best we have ever tasted (second only to the long gone Flying Chicken Tenders Platter Houston's Restaurant used to offer). And for dessert we shared perhaps the finest creation of all time: cookie dough that was battered, fried, topped with vanilla ice cream, and drizzled with chocolate sauce. Oh my goodness – these fried cookie dough balls were so gooey and delicious that we almost ordered a second plate despite being so stuffed with food they needed a wheel barrow to get us back to the family truckster. If you frequent Kings Dominion or Busch Gardens you owe it to yourself to dine at Kreggars. It is a top shelf restaurant, a wonderfully pleasant surprise, and a joint the Rao family would visit regularly if the owners ever decide to expand to Kansas City, Missouri. Just amazing. During the course of this vacation, the Rao family visited several different hotel chains. At Kings Island we stayed in a Comfort Suites about 20 minutes from the park in Cincinnati. It was a great hotel back in 2014 during our first visit to Kings Island, but this year, not so much. Apparently a management change had occurred, and the new team did not seem nearly as concerned with little things like cleanliness and quality. We also stayed at a Comfort Suites in Pineville near Carowinds. It was about what you expect from a middle tier hotel. A decent, budget option, a step or two up from the Red Roof Inn or Motel Hell, but nothing to inspire a repeat visit. We did stay at a decent Holiday Inn Express right across the street from Dorney Park, but even it was a bit tired and dilapidated, with little of note to discuss here. In DC and Richmond we stayed at an Embassy Suites, which we like because the extra expense of the room is justified by the excellent made to order breakfast included with your stay. The location we patronized in downtown DC was not my favorite (parking was a SIGNIFICANT headache), but the Embassy Suites in Richmond was very nice, our second best stop on this journey. Which brings us to our best hotel and that was, of course, Hotel Breakers, the onsite, almost "in park" resort at Cedar Point. 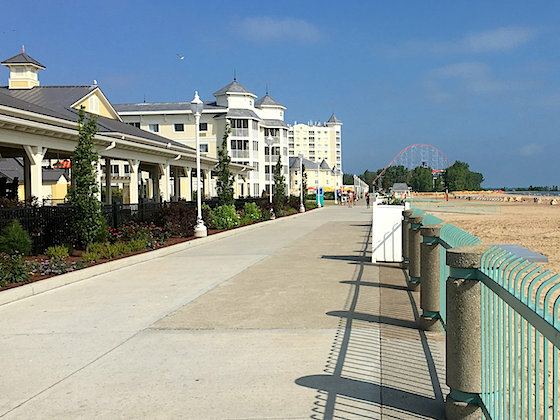 For over a century, Hotel Breakers has welcomed families to Cedar Point to relax and enjoy the thrills of the greatest amusement park on the planet. It even attracted such noted guests as Abbott and Costello, Annie Oakley, a half dozen U.S. presidents, including FDR, and most recently, the infamous and adventurous Rao family. In 2015, Cedar Fair completed an extensive, floor to ceiling renovation of the property, resulting in a beautiful modern resort with old time charm and aesthetics. The place is just gorgeous! And it comes replete with recent and historical images from Cedar Point scattered throughout the rooms, walkways, and lobbies that serve to immediately immerse guests in the rich history of this grand old vacation destination. Visitors to Hotel Breakers enjoy several perks like early entry (which we got with our Platinum Passes anyway), the ability to take a shuttle to the Marina entrance (the closest starting point for the race to either Valravn or Millennium Force), and of course, excellent proximity to the park. Plus, there are a couple of pools (indoor and outdoor) and hot tubs, as well as a nice water play area for little kids, and of course, the beach is just a hop, skip, and a jump away. There are a few things about the resort we didn't like: our room wasn't cleaned until early evening each day (causing us to alter our touring plans so we didn't interfere with the person assigned to the job), the parking situation isn't great (pro tip: don't park anywhere near a light post unless you like seagull excrement covering your vehicle), the bugs (ever a problem at the Point) make outdoor, night swimming nearly impossible, and the onsite, table service dining options are underwhelming to say the least (Perkins, Fridays, and Tomo Hibachi are all fairly low-rated on both Tripadvisor and Yelp). On the other hand, while the onsite dining is a bit lackluster, it's not a deal breaker because there is a full-service Starbucks in the lobby (where those visitors who get their caffeine from some source other than Monster Energy Drinks enter their first line of the day), a somewhat hidden Auntie Anne's pretzel shop nearby between the amusement park and Soak City, a couple decent food options inside the park itself (Pink's and Chickie's & Pete's), and Famous Dave's is ready to serve up some pretty solid BBQ at a marginally inflated price just a short shuttle ride away on the opposite side of the peninsula. While food is not necessarily a highlight of the Breakers experience, it is serviceable enough and shouldn't detract too much from a visit. Overall, Hotel Breakers isn't up to the caliber of a deluxe Disney Resort (it's somewhere between a moderate and a deluxe – similar to Universal Orlando's Royal Pacific or Hard Rock hotels), but it offers a quality stay at a fantastic location, just minutes from all the action. Understand that you are paying for proximity so just like Disney and Universal, prepare to pay a sticker shock premium (pro tip: be sure to use your Platinum Pass to save a nice chunk of change on your room). Despite the expensive Disney/Universal-style price tag (~$300/night) and the quibbles I noted above, the Rao Family can't imagine staying anywhere else on future visits to Cedar Point. Hotel Breakers is now part and parcel of a Cedar Point visit as far as we are concerned. The Rao Family's 2016 vacation was quite a feat. It was like hiking up a mountain then cruising on an alpine coaster down the other side every single day. The climb up was not easy and it took a heavy toll on our bodies, but the pay off on the other side made it all worthwhile. Additionally, it is a lot of fun to tell people we rode 55 roller coasters in eight days! It may not be an impressive statistic to the more traveled coaster boys and girls on this site, but for the general public, it is both impressive and crazy at the same time. Just like the Rao family! The coasters we experienced were a ton of fun, and we rode some great ones, but more than anything else, the best part of the trip, as always, was sharing the experience with family and friends. Face it coasters are better when you share them with loved ones! And as much as we will remember the amazing adventures we had, and the thrilling world class coasters we rode, and the great food we ate, our lasting memories will center on the fantastic time we had touring the parks with Sean, Lisa, and Kate, sharing wonderful Italian food with Uncle Joe and Aunt Joyce, celebrating Americana 1900 (see Theme Park Apprentice on TPI for more info on this "fake" theme park) with Jim and Anton Koehl, Blake Hindley, and Scott E., playing Pokémon Go as we toured the parks, and of course, sharing the experience with my favorite group of people on the planet, Robin, Jacob, Jeremy, and Emma Rao. We had an amazing, stupendous, crazy adventure, one that none of us will ever forget. Well, that's about it, I guess. The Rao Family's 2016 is officially in the books. Thanks for following along and until next year, the Rao family bids you adieu. Ride on! August 28, 2016 at 3:29 PM · Standing and applauding ... Best TPI Blogflume EVER! August 28, 2016 at 3:53 PM · So does it all blurr together for you? My wife and I went on a eight theme park, Monterey Bay aquarium, Muir Woods, ten day trip in California and it's one big blur. I have to go back and look at the photos I took to remember what I did where for some of them. That being said, it was awesome. I just wish I had a couple more days to spend at Disneyland and Six Flags Magic Mountain. August 28, 2016 at 5:22 PM · I agree with TH! I had so much fun being just a small part of this remarkable theme park experience. It is impossible to go to a park with the Raos and not have the best time ever! August 28, 2016 at 9:56 PM · @Tracy The loading and unloading part of the trip did become a bit of blur as we moved from place to place, but our adventures in the parks are still pretty vivid in my mind - probably because of the interactions with family and friends along the way. It's a lot easier to mark moments in time when loved ones are constantly yapping at you to hurry up and get in line for another GIGA coaster! @73.4.98.95, thanks, and I hope you are right! August 28, 2016 at 8:18 PM · James, I always love reading your trip reports, and this one may be the best yet. You covered a ton of ground in two weeks and, if the goal was coasters, you certainly maximized the number of rides for the cost of tickets (except perhaps for the Six Flags version). While the parks that you missed are all outstanding, with so much driving and a limited budget it makes sense to save some for a future trip. -I agree that Cedar Point is probably the best amusement park in the United States, and it is really the only amusement park I would call a destination park (others are what I define as major parks...must visit if you're in the area, but not worth traveling 200+ miles just for that one park). -I'm sad to hear about the state Kings Dominion is in. I visited both it and Carowinds in 2010, and back then I would have reversed most of what you said about the parks. Carowinds has seen major investment in the past several years, and I hope Kings Dominion will get some next (though based on the 2017 announcements I'm not overly optimistic). -Outside of holidays, I doubt Dorney Park is ever busy. My visit was on a Saturday in August, and I was able to do every coaster and noteworthy flat by lunch. -On my list of 365 coasters, Maverick ranks 8th. 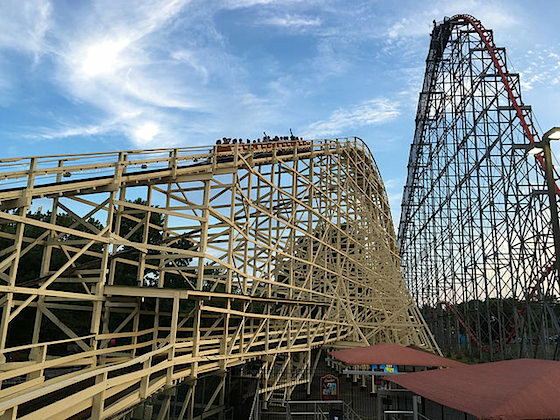 The rides I rank above it include Tatsu and Twisted Colossus at Six Flags Magic Mountain, Phoenix at Knoebels Amusement Park, Voyage at Holiday World, Boulder Dash at Lake Compounce, Superman the Ride at Six Flags New England, and El Toro at Six Flags Great Adventure. Perhaps the Rao family should look into one or more of those parks for their next crazy coaster adventure. -Glad to see I'm not the only enthusiast that thinks Intimidator 305 is so intense that it somewhat diminishes the fun factor. A lot of my friends rave about it being one of the best steel coasters ever built, and while it is my favorite coaster at Kings Dominion it's not something I'd ever include in a top ten list. -Banshee above Afterburn? Talon above Raptor? Any of those above Volcano? You've got some very different inverted coaster preferences than I have. -Outside of the North East (or Voyage on a good day), I doubt there is a wooden coaster better than the Beast. I'm curious how Mystic Timbers will compare next year. -Cedar Downs is absolutely the hidden gem of Cedar Point, and anyone who visits and doesn't ride is missing an amazing flat ride that can't be found anywhere else. -I can't say whether your notion on Demon Drop and Tower of Terror is correct or not, but I can say there is a park somewhere (Italy I believe) that took an Intamin first generation freefall and knocked off Disney with it. -Shame to hear that Plants vs. Zombies was a letdown. The Mass Effect simulator attraction California's Great America put in their theater was actually very good. -I'm going to make a list of your restaurant recommendations for the next time I visit any of these places. On past trips, it has generally been with an organized tour which typically meant park food and/or McDonald's (though there were a couple of exceptions). Once again, great trip report, and I can't wait to read one from your next family adventure. I'm in the process of planning my next trip, so perhaps I'll have another report of my own next year. August 28, 2016 at 9:59 PM · Wow AJ – thanks for all the great feedback and input. You are likely the most traveled coaster boy on this site, so it is always informative to hear your two cents! Yeah, Kings Dominion is in bad shape, really bad. But like you said, if Cedar Fair invests in the park like they did with Carowinds, it can be great again. The foundation is solid; they just need a massive cleanup effort to restore some luster to this once proud park. I've ridden Voyage and Superman/Bizarro (and Colossus back before Six Flags owned Magic Mountain, so it doesn't really count) and they are two of my most beloved rides. But for some reason, and likely it is uniqueness, I like Maverick best. But hey, when you’re talking about coasters of this caliber, the difference between #1 and #10 is minuscule. We’re just splitting hairs at this point. We struggled with deciding between Banshee and Afterburn because they are both amazing inverted coasters, but I think we like the sweeping, flying feeling Banshee provides over the intense, tight moves made by Afterburn. But again, we’re splitting hairs. As for Talon above Raptor, I gotta be honest, I am not a Raptor fan at all. It kind of hurts my head and neck every time I ride it. As for Volcano, like I wrote, if they did ANYTHING at all with that faux mountain instead of just using it for storage and trash, it would be my favorite inverted coaster. As for the restaurants, I definitely stand behind the recommendations made in the article. And I would urge anyone making a similar trip to always make food a part of the adventure. And when you can’t find good, unique eats in the parks, then do some research and find those awesome local eateries close by. You won’t be disappointed! Sometimes I look forward to the food more than the coasters when it comes to these vacations!!! August 28, 2016 at 11:58 PM · Most traveled coaster boy on this site? I don't know...it's possible, but there are still sizable pockets of the country that I have yet to hit (namely Florida, Middle America, and Texas). However, outside of those regions I can only think of one major park that I have yet to visit (Six Flags Over Georgia), so perhaps. Maverick is certainly unique...it packs a huge punch despite not looking overly impressive, it is intense but not so much that it detracts from the ride, and almost everything on it is executed perfectly. You're definitely right about differences between elite coasters, however. While I do keep a complete list, I usually will just describe rides by which tier I place them in as the differences within a tier are often fairly small. I also definitely get the dilemma regarding the inverts as they are all very different rides. Afterburn is short, but it is intense and is great if you love rapid-fire inversions. Banshee is long and gives a lot more of a flight feeling, but the layout isn't quite as interesting (at least in my opinion...some would say otherwise) and this one tends to rattle a bit. Talon is somewhere in between...it is a good length, but not overly intense, and while it has a decent layout it isn't overly unique. Raptor is an old school B&M and has the intensity, but the layout is lacking and this one is definitely the roughest of the bunch. Volcano is an entirely different beast altogether...it has a high speed launch followed by a repetitive spiral high above the ground before diving into the mountain, but the ending is a huge missed opportunity and another 500 ft or so inside a highly themed mountain would make this amazing. It's hard to compare them, but regardless of ranking they are all good. Just for reference, my favorite invert is actually none of these, but is instead Alpengeist at Busch Gardens Williamsburg. That coaster is best described as a bigger Raptor with a better layout, more theming, and less roughness. 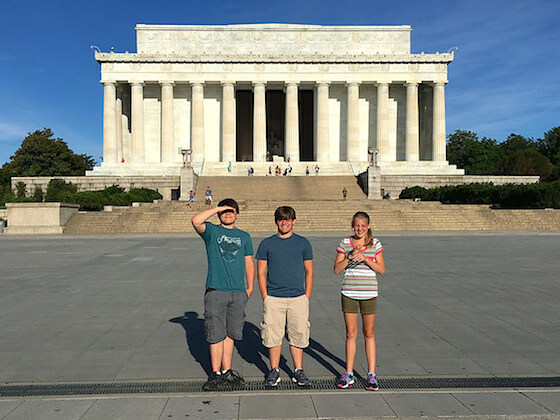 August 29, 2016 at 4:37 AM · Great trip and write up James ! I've been to all of those parks somewhat recently, except for King's Island (hopefully next year) and Dorney Park (maybe someday), never more than one on the same trip though. When my kids get older, I may need to borrow your idea. I definitely agree that Maverick is THE BEST roller coaster out there. Last year I spent a little over half a day at CP with a fast lane pass, and we rode that multiple times back to back. It was my 3rd visit to the park since Maverick opened too, so not just a case of being in awe for the first time. Unfortunately it cost me the opportunity to get on Gatekeeper for the first time, but overall I'm not too upset about that. I was in Central Florida last week on. SeaWorld/BG/Universal trip, so went on Shiekra a few times, which was my first dive coaster experience. I thought it was really cool, so can't wait to try out Valravn if that is better. I also am very fond of the Demon Drop ride, having rode it several times when it was at CP. It's obviously not that tall, but the design really made it great. Funnily enough, that very ride is a big reason why I would make a stop at Dorney if in the area. Speaking of unique drop tower rides though, Falcons Fury at BG Tampa definitely put me in awe last week. The sun kinda blinded by when watching it from the ground, so it was a HUGE surprise (while on the ride) when it pivoted forward at the top. August 29, 2016 at 9:00 AM · Okay, I only just now discovered this article (why didn't one of the Jameses text me?!). Excellent recap, Mr. Rao, and certainly it brings me back to the legs I was a part of. It was truly a treat to meet you and your lovely/crazed family, even if I was never fully able to tell you apart from your two sons. You guys were so much fun to tour with, even if you and I visit parks very differently. (When you would crash, I would reenergize, and vice versa.). With Mr. Koehl's permission, I'll add what I said to him about Maverick, the James Rao of roller coasters. The coaster comments - from my limited exposure - are all very accurate. Banshee>>>>>>>>>Raptor. The one thing I'd add is a non-coaster recommendation for the skeleton-infested Cedar Point Railroad, which I found just as fun in its way as the wonderful Cedar Downs. Regarding food, all the best meals I enjoyed with Mr. Koehl were outside of the parks: roadside diners, fine chocolates in Sandusky, comforting meals at his home. And of course Famous Dave's with the entire Rao clan, which climaxed with this bizarre outdoors weather phenomenon I'm told is called...rain??? Apparently it's something that happens in Ohio; we've never seen anything like that in L.A.
Now to reignite the talks about next year's adventures! The parks you didn't visit this year - Dollywood, Hershey Park, Americana 1900 - all must be visited! Now I shall abruptly sign off, as I'm writing distracted on a phone. Great article! August 29, 2016 at 10:30 AM · Great report, James! I very much enjoyed reading about your experiences and many of your comments really resonated. Wish I had the stamina to embark upon such an adventure. As to Carowinds, I am in complete agreement about how wonderful this park is. I went there a little over 2 weeks ago to celebrate my 65th birthday (not that that's anything worthy of celebration) and was as impressed as on my 1st visit last year. Managed to get in 17 roller coaster rides, including 7 on Fury 325, in the space of 5 hours. Re Fury, I can state unequivocally that this coaster has the most efficient ride operation of anything I've ever ridden. The speed of loading and dispatch is remarkable. I agree with you about Intimidator. This coaster is consistently ranked among the top 10 and I just don't get it. Sure, it's a good ride but two years in row, for me it was one and done. Didn't feel any strong inclination to re-ride. On Carowinds in general, it's a beautiful park and I love the shady promenades. I also love Flying Dutchman coasters and b/c this park has one of only three in existence, that's another point in its favor. When it comes to dining options, as a vegetarian I find it difficult to locate tasty fare at theme parks but the baked pasta at Harmony Hall in Carowinds filled the bill. Kings Dominion: This is one of my favorite parks b/c of the rides and I guess I didn't notice how shabby it had become, possibly b/c I was having such a good time with multiple rides on I-305. Unlike you, I really enjoyed Flight of Fear. Giga coasters: Agreed that I-305 is the most intense. It's also my favorite of the three you mentioned, not only b/c it's so intense but b/c it's so different. Fury 325 comes in 2nd and Millennium Force last. On inverts: Haven't ridden Banshee so can't comment on that but it's a toss-up between Afterburn and Volcano. I got an ear boxing on my 1st ride on Afterburn a couple of weeks ago but for the next 2 rides sat in a different seat and the problem was resolved. Talon is a close 3rd. I think that this coaster is very much underrated. Dorney Park is much maligned; people on a coaster-based website I visit make fun of it all the time. I like it well enough to have a season pass and while it's true that the coaster lineup is less than stellar, as you say almost everything is a walk-on and that is a great advantage. It's just unfortunate that park policy prohibits consecutive riding even when no-one else is waiting for your row, and the ride ops are so lackluster. That brings me back to Carowinds. I ended up riding The Hurler (not one of my favorite rides)3 times in a row b/c the ride ops made a point of announcing that if no-one was waiting for your row, you were welcome to stay on. In the blistering heat it took less effort to stay on than to get off and find something else to do. August 29, 2016 at 11:32 AM · Fantastic article...yes CP is the best! August 29, 2016 at 1:47 PM · @AJ The last time I rode Alpengeist was back in 2008, and while I remember it being my favorite inverted coaster at the time, I just don’t recollect enough about it to fairly compare it to Banshee. But I take your word for it that it is the best because I do remember being quite impressed. @Jim As for me and my foodie ways, yes, you know me far too well! @Blake Sorry for not letting you know – Jim K sends so many overlapping emails I never know who is and who isn’t included. I guess I could have gone back and checked, but fishing his emails out of my SPAM folder is never fun. As for the Cedar Point Railroad, I agree, it is a fun adventure, however it takes a commitment of time to get the full circuit, and time is not something we had in vast commodities with over 55 coasters to visit! And yes, that rain storm that exploded over us when we were in Famous Dave’s was most impressive. But what was even more impressive was seeing it bring literal tears of joy to your eyes – like you were watching the Hand of God in action. Never before have I seen a grown man so desirous to run out and play in the rain. Only the threat of Jim eating your half of the Feast for Two kept you from getting thoroughly soaked! ;) As for next year’s adventures, well, who knows? Americana 1900 is definitely at the top of the Rao family’s list for sure! @Bobbie Wow, 65 and still cranking out more coasters in a year than the entire Rao family put together. You are like a Goddess among mere mortals! Are you sure you’re not one of those ultra-cool vampires from Twilight? Does your skin get all glowy in the sunshine???? Regardless, I am impressed and, of course, Happy Belated-Birthday! Anyway, I totally agree with you on the ride ops for Fury 325 – that crew was particularly good. They were getting trains ready in less than 30 seconds at one point. It was amazing. I wish all ride ops tried so hard! As for Kings Dominion, there’s a lot of good in that park buried under a mountain of grime and weeds. It just needs some TLC… it is not too late. And we didn’t hate Flight of Fear, it’s just a bit painful, and not as good as the version at Kings Island. Additionally, Dorney is a perfectly respectable local park. I probably wouldn’t plan a trip to visit again unless they added some killer new coaster, but if I lived nearby I would pick up a season pass once every few years or so, just like I do with Worlds of Fun here in Kansas City. They are very similar parks. And, in response to your comment, “Thanks for sharing”, I say, “No, thank you for reading!” Keep coasting, Bobbie - you are an inspiration to us all! August 29, 2016 at 12:45 PM · Fantastic write-up, thanks for sharing!! August 30, 2016 at 8:00 AM · Awesome adventure that I'm sure your children will be telling your great grandchildren about one day. I am truly jealous of your vacation... So I hope you step on a Lego - There I feel much better now..
August 30, 2016 at 1:01 PM · Great article. I am also from the KC area. After this trip of yours, don't you now feel like we are getting ripped off in the KC area with our forgotten little park and the few improvements that has been made over the past decade (not counting Prowler, of course)? August 31, 2016 at 4:31 AM · @Mike Sure – thanks for reading! @170.40.160.233 I hope you are right. The kids sure seemed to have a good time. I know I would have loved such a trip if I was a kid! @Brian Emery Darn, Legos! Ouch! What? Oh...so it’s your fault...! @TwoBits My frustration with Worlds of Fun started years ago when they destroyed the Orient Express, sold the Zambezi Zinger, got rid of the parking lot trams, and closed the original park entrance. But plans to reshape the current entrance and rumors of a new coaster coming in 2018 have me intrigued. Maybe Cedar Fair is ready to step up to the plate and start investing in the park again? Oh well, at least we have Silver Dollar City just 3.5 hours away! September 3, 2016 at 6:17 PM · Great vacation review! We are near the end of a similar adventure. Living near DC, our home parks are Kings Dominion and Busch Gardens and have gone to both a few times this year. We also made a quick trip earlier in the year to Hershey's and Dorney's. But for this last week before school starting, we (myself, my wife, and my 4 kids (13,12,10,5)) decided to go to Niagara as a family and of course do theme parks along the way. First, Knoebels. Then Niagara for two days. Then Canada's Wonderland. Followed by Cedar Point. And finally Kings Island tomorrow. Knoebels was fun, but not as thrilling as I hoped. Though Phoenix was a great ride! Canada's Wonderland was standard fare, though Leviathan was outstanding. Niagara was beautiful and awesome, of course. Went under it, below it, and above it! Millennium Force is still my favorite at CW, but Valravn definitely gives Gryphon a run for its money. Looking forward to Banshee tomorrow, but I do believe that The Beast will stay as my favorite. Definitely a world wind vacation! Thanks to my kids for allowing me to drag them through it! Ha! Are Disney's theme park annual passes a good deal?